In North America, over a million infant calves pass their short lives in wooden crates to produce veal for the table. Their mothers in the dairy industry are condemned to a continuous cycle of pregnancy-birth-lactation to keep producing milk. 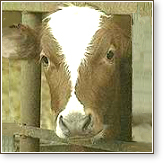 The veal and dairy industries are therefore completely intertwined and interdependent. In a dairy operation the female offspring replace the slaughtered milking cows, but the male calves, once born, have little value for farmers. One common outcome is to simply leave the calf to die of exposure or to smash his skull with a handy shovel or sledgehammer. Where there are dealers to collect them, newborn calves are sold as "bob" veal for about $50 apiece and killed, barely able to stand, at under a week old. In larger dairy operations, where more infants are available, traders buy them for sale to veal producers. Once there and crated, they are treated as nothing more than mechanical units of production, never as living creatures with needs and natures of their own. The extreme intensive confinement system for raising veal calves was developed in the 1950s, as every sector of factory farming experimented with industrial methods to increase output and profits, reduce overhead costs by using automation, and shorten the time needed to bring animals to market weight. By the 1960s, the gruesome details of the handling and rearing of veal calves were revealed to astonished and disgusted consumers. In some countries at least, the shocked awareness of the public has resulted in a sharp decrease in production. (In the U.S., for example, veal consumption is down by 70%.) Many people no longer eat veal, while many also avoid restaurants that serve it — a food that embodies outrageous cruelty. Millions of calves around the world are reared and killed annually to provide veal for local and international markets. Australia, Brazil, China, the EU, New Zealand, and North America are the largest producers. Veal producers have developed specialized systems to extract high meat yield and profit in a very condensed growing cycle. Newborn calves are collected at dairy operations, many never suckling the initial protective colostrum from their mothers. At most they may be two or three days old and already so weak that many are unable to walk. They are placed in wooden body crates barely wider than their shoulders, with slatted sides and floors, with no bedding, unable to stand or lie down but perhaps allowing a single step forward or backward. It's a wooden box, almost a coffin. To produce pale bland flesh, they are fed an unnatural liquid milk-replacer diet deficient in iron and minerals, with no hay to eat. The veal calf is by definition a sick, deliberately malnourished animal. As infants, their instinct is to nurse, and as they grow, the calves become desperate for something to chew on so they gnaw at anything they can reach, like the sides and floors of their crates. To prevent this, the handlers chain them to the fronts of the small wooden cage. Lack of movement also contributes to keeping the muscles from developing and the meat darkening. Constantly frustrated and hungry, any human activity in the barn agitates the calves and they struggle and throw themselves against the walls, injuring and wounding themselves. Therefore feeding and cleaning procedures are as short and automated as possible; at other times the sheds are dark to keep the calves quiet. In this barren environment, the calves' most basic needs are never met. Instead, they must suffer a small space allowance, no social contact, the denial of roughage, minimal fresh water, darkness, and weakness from low hemoglobin levels, which are maintained to produce the white meat. Under these circumstances, they are susceptible to a long list of diseases, including anemia, chronic pneumonia, septicemia, enteritis, lameness, and diarrhea (causing dehydration and a loss of electrolytes). With continuous restraint and deprivation, from the beginning to the end of their short lives, veal calves are the most miserable of farmed animals, the most pitiful victims: a reflection of extreme human cruelty and greed. Veal calves are slaughtered anytime from birth until they reach market weight at approximately 200 kg (440 lb). Protocols for the humane slaughter of cattle require that certain standards be met that apply to the collection of animals, transportation, off-loading at the abattoir, watering and feeding, holding areas and ramps, handling in the slaughter area, animal inspection, stunning to unconsciousness before killing (with the exception of ritual slaughter like Halal and Kosher), stunning methods, killing procedures, bleeding, skinning, hygiene at all phases, prevention of contamination, butchering, meat inspection, meat storage, and food processing. Very specific standards are embodied in legislation across the world, with regional trade agreements, as well as international agricultural organizations (for example, the FAO — the Food and Agriculture Organization of the United Nations) encouraging everyone involved to adhere to these standards. The FAO, in particular, strives to spread humane animal treatment criteria to countries in the developing world. On the face of it, trade pacts are respected, food safety is maintained, and the humane treatment of animals is assured. The reality is far different. In its Guidelines for Slaughtering, the FAO itself states, "Although controls imposed on the meat industries have become more stringent and effective, improper treatment of slaughter animals and poor meat-handling techniques persist in many meat plants." The implications of this assessment are chilling and horrifying. At night, to keep them quiet and manageable, hundreds of distressed calves are crowded onto trucks to be brought to the slaughterhouse. These trips in themselves are frequently their last experience because many will die from the weather extremes or be fatally wounded from trampling en route. Most veal calves are unable to walk, having spent their entire lives chained in a box. In winter some of the infants arrive frozen to the metal of the trucks, in summer dead from dehydration. The obviously wounded or dead are thrown aside onto the "downer pile." The rest cluster in fear in the holding pens and are then pushed up the ramps leading to the mechanical conveyor chutes. In their hysteria and panic, the calves become extremely unmanageable and the staff often use electrical prods to shock them to move forward. The handlers must keep the line moving, and if they meet any resistance they will grab a pipe or crowbar and beat the calves until they move on. In this pandemonium, the poor animals are stepping on one another and getting caught in the rails along the way. Workers have been seen yanking a calf's limb out of a fence, breaking it, or taking a hacksaw and cutting it off. As one example of the appalling conditions endured in transport to Israel, in 2006 a ship unloaded 4000 calves who were to be sold to the Palestine Authority. Suffering from starvation, serious breathing difficulties, and additional medical problems, they were transferred to a holding station in the regional pound, where 500 died. In another case in Israel in 2006, dozens of calves died from hoof and mouth disease, with great suffering, and others were killed to stop the disease from spreading. The calves had been shipped from Australia, and the cause of the disease is thought to have been their subsequent transportation in contaminated trucks. The disease spread quickly because of the terrible conditions the calves were kept in — crowded pens in the veterinary stations, with sick and healthy calves confined together. In the morning the big holdup is the calves, he said. To get done with them faster, we'd put eight or nine of them in the knocking box at a time. As soon as they start going in, you start shooting, the calves are jumping, they're all piling up on top of each other. You don't know which ones got shot and which ones didn't get shot at all, and you forget to do the bottom ones. They're hung anyway, and down the line they go, wriggling and yelling. The baby ones — two, three weeks old — I felt bad killing them so I just let them walk past. That's what he said, "…I just let them walk past." A chain is put around one leg and they are hoisted up and connected to the next conveyer belt moving them to the "sticking" station for their throats to be cut. The arteries in their necks are slashed, even as they are squirming and bleating. They are bled, the food pipe is tied off, and facial skinning is started. The nose, ears, and feet are cut off, and some calves are still responsive and obviously in pain. Calves are born as valueless, disposable nuisances on the dairy farm, but after slaughtering they have great value. Calves' bodies supply meat cuts like veal, organ meats like liver and brains, pet food, fine leather, as well as ingredients for pharmaceuticals, cosmetics, and many industrial purposes. Animals have past, a story, a biography. They have histories. . .each is a unique somebody, not a disposable something. Please watch this video clip of a seven-week-old calf, Harvey, rescued by VINE Sanctuary in Vermont, USA. The video was taken on the very happy day of his arrival at the sanctuary.